The vinegar and lime acidity cuts through the sweetness from the maple syrup, and when paired with the fragrant heat from the fresh ginger it brings out the peanut and sesame flavors. But not without the sweet chili sauce. It adds complexity – a complexity you want – that makes the sauce. In other words, “holy moly this is good”. 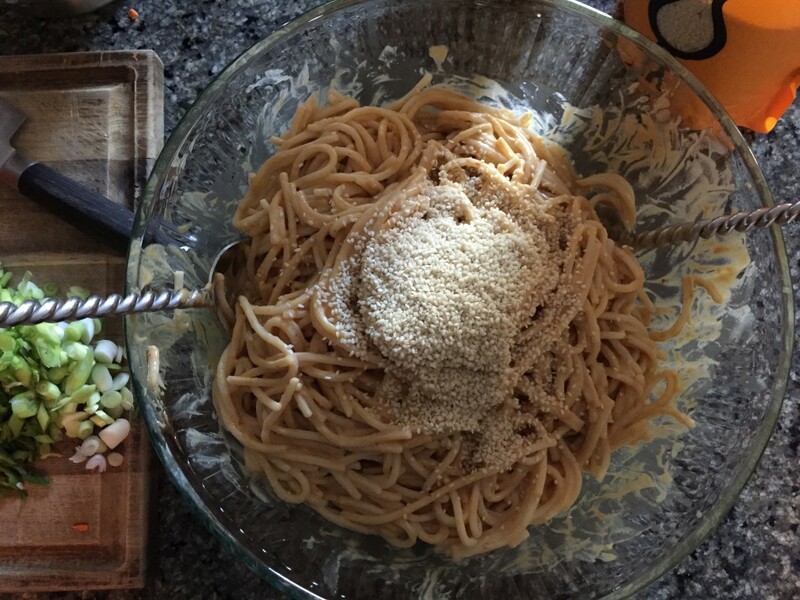 I use quinoa spaghetti because it tastes the closest to soba noodles and doesn’t mush up, almost any gluten free spaghetti/noodle will do. The only brand I don’t recommend is Trader Joe’s or Tinkyada spaghetti because both make very clumpy, starchy pasta noodles (just being honest with you). If quinoa spaghetti is not available in your area, try rice spaghetti or noodles. Annie Chun or Lundberg has good options. Be careful when buying “buckwheat” noodles, most contain wheat. 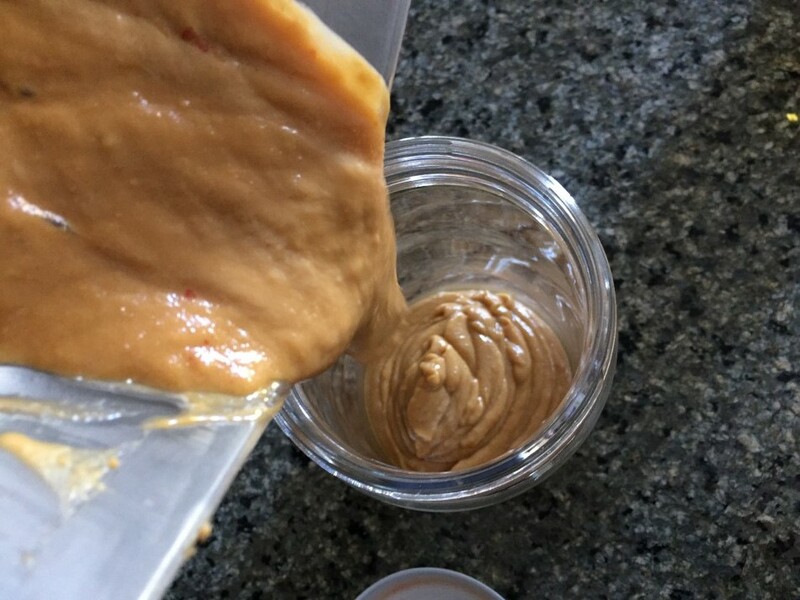 Don’t let the good dose of peanut butter in here sway you; this will make plenty. When broken down, it really isn’t as much per serving as it seems and will present you with the most creamy dreamy noodles you have ever slurped. These also make fun little appetizers in little clear disposable cups with forks stuck in the center (for those who are clumsy with chopsticks – that being me), or chopsticks instead, for those not clumsy, unlike me. Come morning, there’s nothing better than speeding up my school morning rush with a quick hustle of noodles into the boys lunch containers. Times three in two minutes. I love the easy math here. Do you have kids? If so, you know what the morning rush is like (!). Serve as-is or side with grilled chicken or salmon. I prefer as is, my guys prefer sliced chicken strips in their bowls. 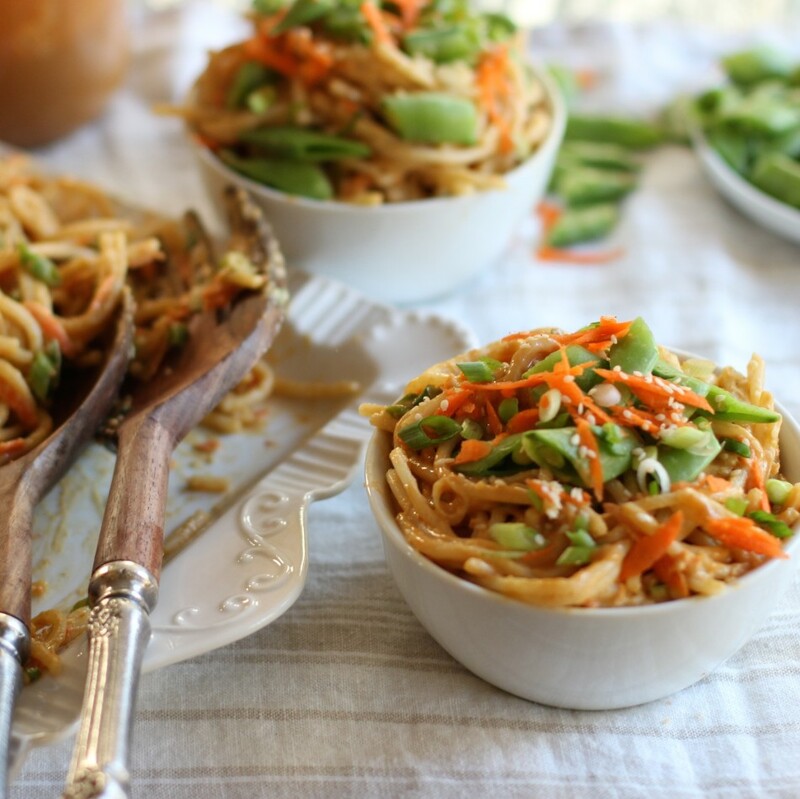 Either way, it’s just like take-out style noodles but better … enjoy! 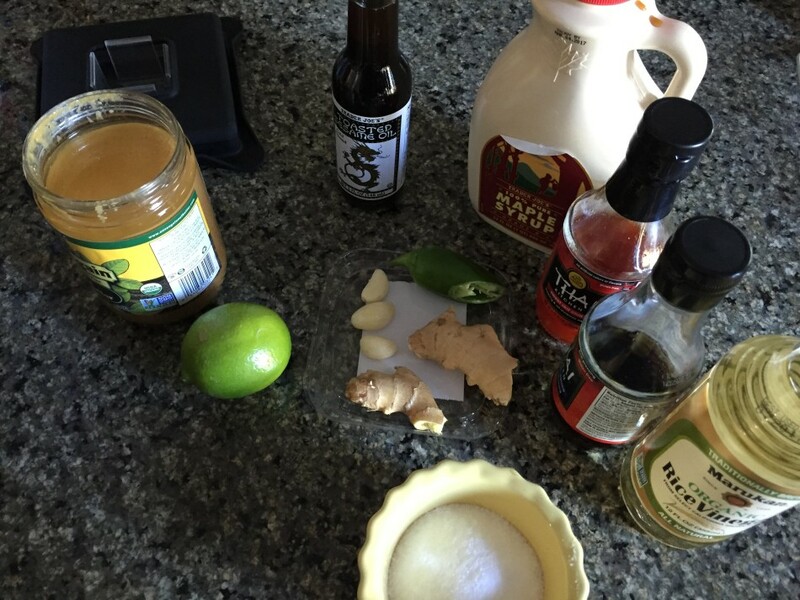 Add all peanut sauce ingredients into the blender … ready in 30 seconds. Once noodles are ready, add other ingredients. I combine sauce with pasta in two batches for easier mixing. Sauce up the noodles. You decide how much or how little, I use about 2/3rds of the jar. I didn’t toast my sesame seeds this time due to laziness. Not the worst thing ever if you don’t but it does add extra sesame flavor. 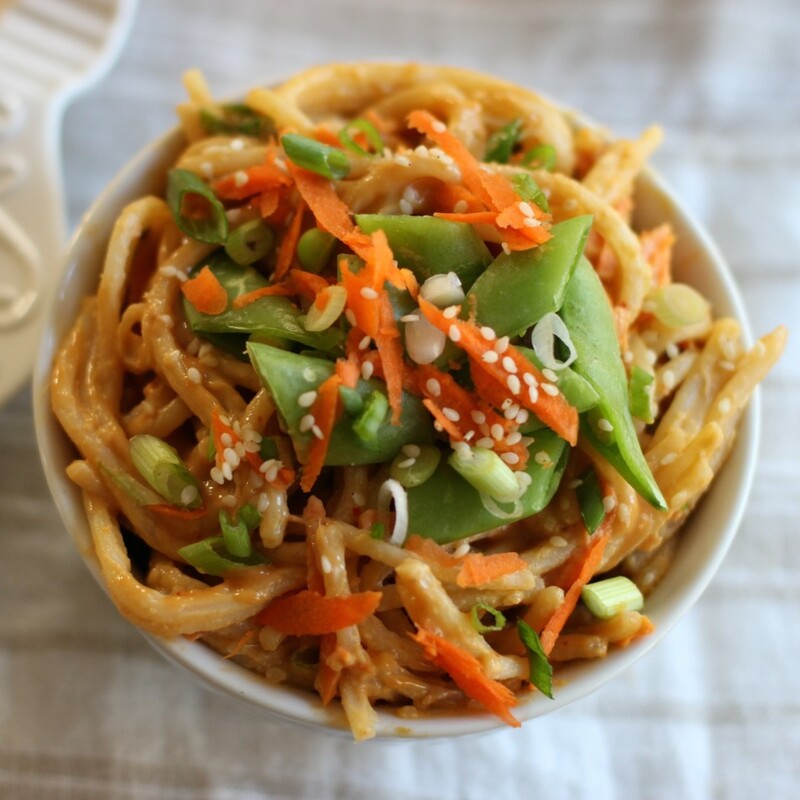 An easy takeout-style peanut sesame noodles recipe that will have you slurping away the most delicious Thai-inspired bowl of goodness in under *30 minutes. A perfect make-ahead meal and for leftovers for school/work lunch! *Pasta cooks while you prepare the other components making this one-bowl meal in under 30 minutes. Fill a large pot with water for the spaghetti. When boiling, add kosher salt then spaghetti and stir. Cook spaghetti according to package directions then turn off heat and let it sit in the water for 2-3 minutes for softer Asian-inspired noodles. Drain and transfer into a large bowl. Set aside. Meanwhile, prepare the other ingredients. Optional: toast sesame seeds in a small skillet (tossing often) over medium heat until lightly browned, about 2 minutes. 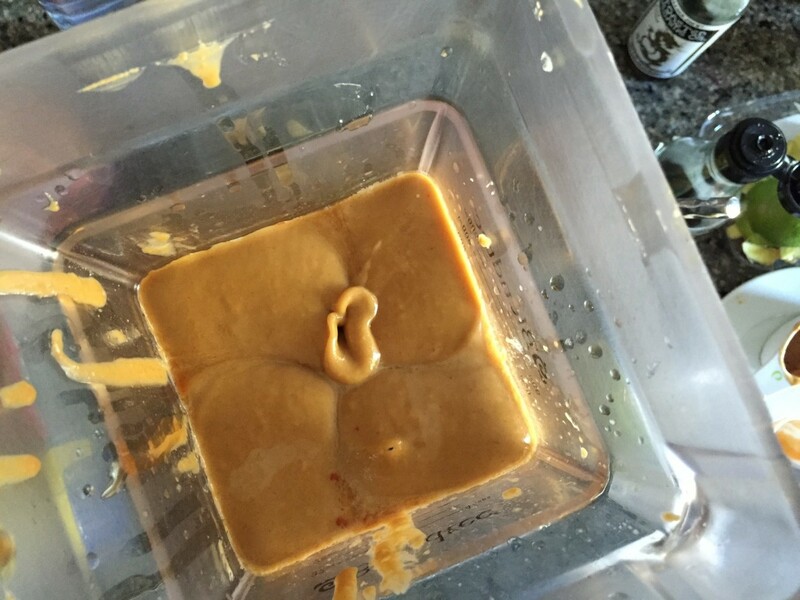 For the sauce: pulse all the peanut sauce ingredients in a blender or food processor until smooth. 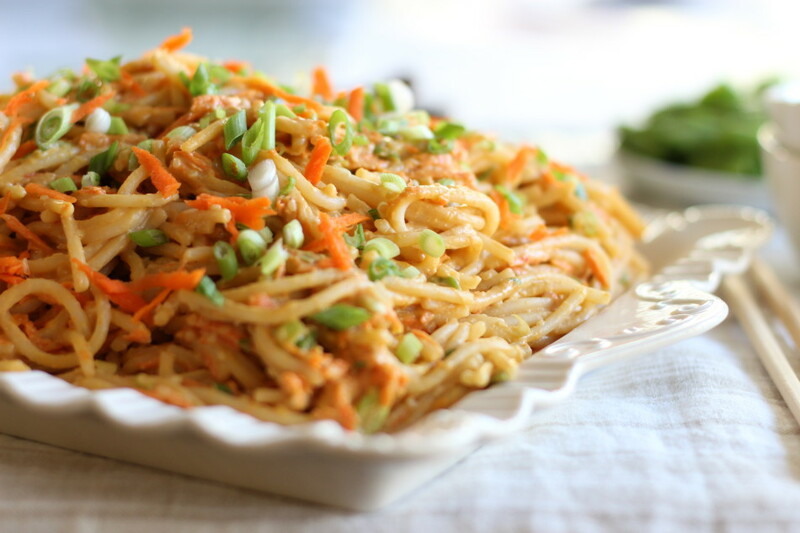 Add half of the peanut sauce to the noodles and combine. If you find it to be too thick add a splash of rice vinegar and maple syrup. Note: This will make nearly a quart. I use two-thirds and save the rest for salad dressing (my fave: napa or savoy cabbage, romaine or dino kale, scallions, almonds, carrots, jicama, basil and/or cilantro) or as a dipping sauce for grilled chicken strips. 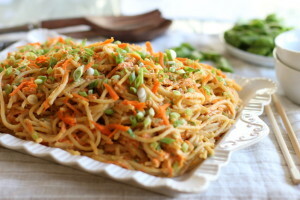 Reserve some sesame seeds, sliced scallion, shredded carrot, and snap peas, for garnish, if you like, before adding the other prepared ingredients. Toss to combine well. Serve room temperature or chilled. Can remain refrigerated for up to a week. Freezer friendly for up to a month in a tightly sealed container. For vegans: omit the fish sauce and use sea kelp flakes or vegan dashi powder (dried edible sea kelp). 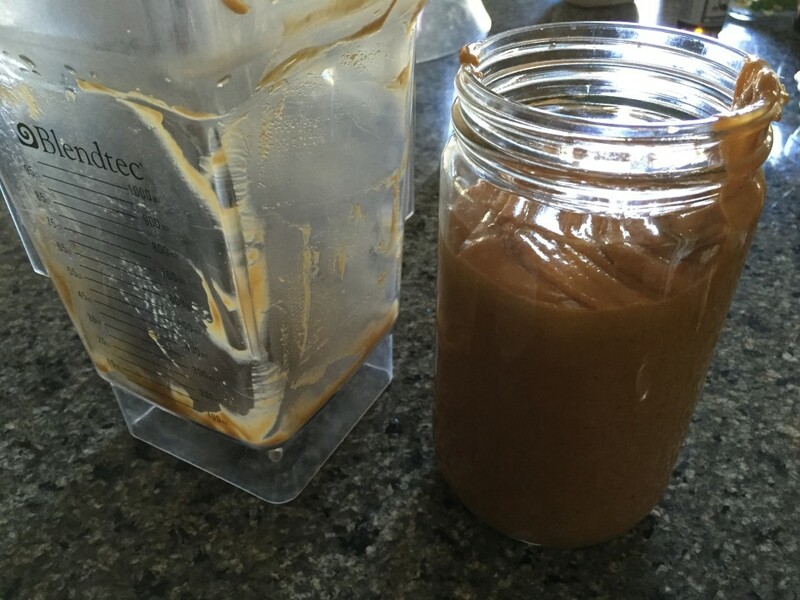 If peanut free, try sunflower seed butter. 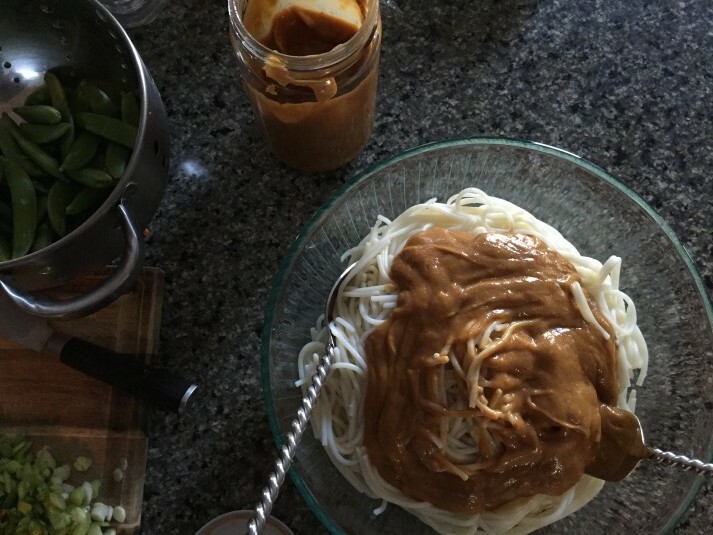 I have made this with sunflower seed butter and find it to be delicious with some modifications: a bit more sesame oil, a splash or two more of rice vinegar, and sweet red chili sauce. Taste as you go. Some other additions to try: mung bean sprouts, jicama, or mint. For Spice: add more jalapeno or red Thai chili if you prefer spicy. This is more on the mild side since my little guys do not it too spicy. I get a chuckle out of reading your posts! 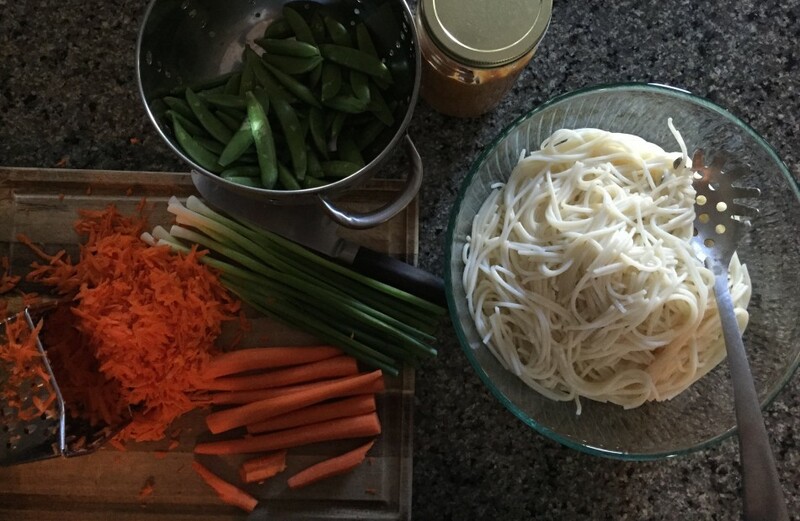 Though my kids are still young and I haven't experienced all the homework yet I can completely appreciate a quick and easy dinner especially when there's a whole bunch of noodles involved. This looks delicious!!! How did you know that Thai noodles are my favorite? Your pictures really pop and I can't wait to make them the way you describe. Me too, I can never get enough. Thanks Leslie! Hope you get to try it, it's really good. Thank you for suggesting a peanut-free alternative because I was about to ask. I agree, the Trader Joe's pasta makes a big pot of mush. Barilla now makes a gluten free pasta that I think is pretty good. This looks like something my family is going to love, thanks Jessica! I'm loving all the flavors in here. Have you ever made this with shrimp? I have been into thai minded flavors recently and can't wait to try this. Sadly I think I am the last person on earth who doesn't have a blender. Any suggestions on how to make the sauce without it? I do have a food processor, would that work? Thanks! Hey Olivia, you can certainly make the sauce in a food processor. Be careful not to fill it up too high and do so in batches if it's not one of those huge monster-sized ones as it will make a heck of a mess once the blade goes wild. Spoken from experience! I don't normally try new recipes so quickly but when I saw this on foodgawker I had to just wanted to comment that this is so delicious! I halved the recipe because it did look like a lot but now I wish I didn't. I used Annie Chun rice noodles and it was perfect. Happy to have found your blog and this recipe! Ah, thanks so much for sharing Amy, I know, never enough! SO happy you enjoyed it and finding my blog, hope you get to try some more recipes! Wish I had this for lunch today. Looks delicious. I just made this and oh wow is it delicious! Love all of the flavors, I didn't find snap peas so I added beans sprouts. Definitely making this again. Thank you for sharing! 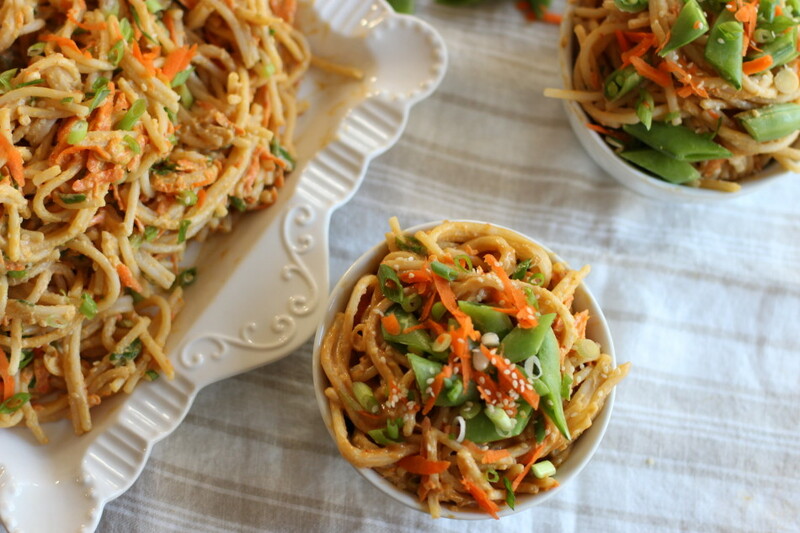 Couldn't stand the thought of cooking today with the LA heatwave so I made these noodles and omgeee are these crazy good. I like that it doesn't scream peanut butter and its got a bunch of flavors. Great recipe!! This came out delicious! Lots of flavors...I made it for dinner last night and had it for lunch today. A yummy option on hot days! This was amazing. The best thing I've made in awhile. I never comment on recipes, that's how delicious this was. Thank you! !